So anyway, she & her man, Rich, were out in SA visiting family & friends for Christmas and we got together for drinks last night. It was good to catch up, it happens so rarely these days. It's a strange thing these cross-continent friendships and they're hard to maintain, especially when you're used to more regular contact with a person. Keeping in touch via email is not as easy as it sounds and it's a lesson I've been taught repeatedly by people I once considered really close friends but now speak to twice in a year if I'm lucky. And often it's just as much my fault as theirs ... it's easy to get wrapped up in your own life. After that, I introduced Varen to my all-time best-ever Jhb restaurant, Cranks. It's this fantastic little Thai Vietnamese place in Rosebank (between the Mall & The Zone). Cranks @ The Mall, Cradock Avenue, Rosebank 011 880 3442. 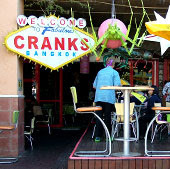 Cranks cooks up a storm with its Bangkok go-go bar theme; the menu extends to Vietnamese and Indonesian dishes. Excellent location, cosmo, authentic thai cuisine, colourful in every way. I love this place, with it's zany decor and it's tasty curries. The service isn't great, but it's usually packed. The owners are fabulous, the crazy German guy with his Thai-Vietnamese wife who are there every day getting stuck in with the all the menial restauranty-type things. So yes, it was a good evening :) And today it's Friday so, here's to a good weekend. Next week will be my first 5-day week since the last week of November! Yikes.